I love quality soaps. My time in the shower is one of the few "breaks" I get from the chaos of my life, so I love to use products that enhance my shower! I recently tried our a new French Milled Plant Oil Soap that is made in Australia, and I LOVE it! 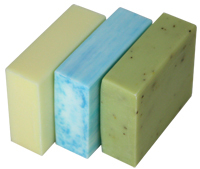 Australian Soap makes natural-based soaps. These are not soaps that are absent of smell. These have a beautiful fragrance, with my favorite being French Pear. The scent seemed to be enhanced when I used the product. The soap made my skin very soft, and I had no adverse reactions-- even with my sensitive skin. I loved the lather created and it made for a really great shower experience! This is the perfect soap for treating yourself!